In the first part of this series, I presented some issues with perpetual harvest models for cultivation with respect to inefficiencies in technology and environmental monitoring. I made the case for compartmentalizing cultivation facilities to not only increase energy efficiency, but also to mitigate contamination and control risks for pest incursions. In the second part of this series, I will elaborate on how compartmentalizing your facility can help you stay compliant with pesticide use regulations and promote worker safety. Where there are pests there are pesticides, whether they are low-toxicity materials derived from natural sources or chemical products that are illegal to use on cannabis. Even in the case of growers that are following current pesticide guidelines and using only products approved by their state department of agriculture, perpetual harvest models present issues in ensuring that the workplace is safe for employees and compliant with pesticide use regulations. One obvious difficulty is the impossibility of containing drift from pesticides applied as foliar sprays. At this point, due to the lack of research performed on pesticides and cannabis, there are currently no defined pre-harvest intervals (PHI), even for products allowed for use on cannabis. A pesticide’s PHI is the number of days that must pass between the time of the last application of a pesticide and when the crop is cut for harvest. While no official, research-based PHIs have been outlined for pesticide use on cannabis, most conscientious cultivators refrain from spraying their crops with anything once flowers have emerged, as the resinous, sticky buds and their many crevices would presumably retain a great amount of any material applied to them. However, flowers do not generally emerge fully until the third week of the flowering process, and many growers apply preventative applications in the first two weeks of flower. In a perpetual harvest facility, what is to stop drift from applications made early in flower from contacting plants close to harvest? One could simply not spray in flower at all, but eliminating early-flower preventative treatments could increase the chances of a pest incursion, which, as discussed above, can be seemingly intractable in this type of facility. It is important to consider the restricted entry interval (REI) when dealing with pesticide use. The REI of a pesticide is the period of time after an area is treated during which restrictions on entry are in effect to protect people from exposure to hazardous levels of pesticide residues. Most of the products and materials approved for use on cannabis in Colorado have no REI or a relatively short one. At the time I left my former facility, the longest REI for any product in use was twelve hours (for Evergreen Pyrethrum Concentrate), though most had REIs of four hours or less. This issue could be avoided in a perpetual harvest facility by simply always scheduling pesticide applications at the end of the workday; if a product is sprayed at 6 PM, for example, then the treated area should be safe for entry by the following morning when employees arrive. However, what is to be done if a pest incursion is discovered in the middle of the day and an immediate treatment is necessary to prevent its spread? Would the management or ownership of such a facility be willing to clear out the entire perpetual harvest area for 4-12 hours, potentially leaving other tasks unperformed or incomplete, so that a few plants could be sprayed? Even if operators went to such lengths to observe REIs properly, instances such as the hypothetical described above would create massive interruptions in daily workflows and scheduled tasks that are highly undesirable in a well-managed commercial setting. Compartmentalization allows for essential tasks in a single room that might need an emergency treatment to be completed in a timely manner, and cordoned off after the pesticide application to observe the REI. A final point concerning this topic is that perpetual harvest facility designs make it difficult to observe certain requirements of the Worker Protection Standard (WPS). WPS is administered by the EPA (but is enforced by the Colorado Department of Agriculture (CDA) in that state) and consists of training intended to reduce the risk of pesticide poisoning and injury among agricultural workers and pesticide handlers. WPS training is required for all agricultural workers and pesticide handlers, including those in the legal cannabis industry. One requirement of WPS is that employers provide decontamination supplies for their employees in case of accidental pesticide exposure or poisoning. Sandra McDonald is a pesticide safety expert and owner of Mountain West PEST, which provides WPS and other training to farmers of all crops in Colorado. She states that decontamination supplies cannot be stored in areas that are to be or have been treated by pesticides (such as perpetual harvest rooms, for the purposes of this discussion), as the applications could possibly contaminate the decontamination supplies with pesticide residues, making them useless or even dangerous. So, in a perpetual harvest facility, where does one store decontamination materials? Again, while there are solutions to this question, they are not ideal. The materials would of course have to be located outside the perpetual harvest room, the entirety of which is a “treated area” at one time or another. But, in facilities the size of the ones under discussion, it could be difficult for an employee who has been exposed to pesticides to reach an eyewash station if he or she has to navigate the expansive perpetual harvest room, as well as a doorway or two, in order to gain access to safety supplies located somewhere that pesticide contamination is not a risk. McDonald notes that most of the products approved for use on cannabis by the CDA would not require immediate decontamination. However, as not to downplay the very real risks posed by some approved products, she also points out that first aid statements on the labels of such pesticides recommend at least 15-20 minutes of continuous rinsing in the case of a worker getting pesticides in his or her eyes, and treatment that takes place sooner rather than later is obviously preferable. Additionally, there are some approved materials with high pH levels that could be immediately damaging if a worker splashed them in his or her eyes. The issues raised by perpetual harvest designs in respect to pesticide use and worker safety are amplified greatly if businesses operating perpetual harvest facilities employ or have employed chemical pesticides that are illegal for use on cannabis. Unfortunately, the illegal application of restricted-use pesticides has revealed itself to be widespread, as examples from Colorado and Washington illustrate. One of the most commonly used illegal products, Eagle 20EW, carries with it a 24 hour REI. 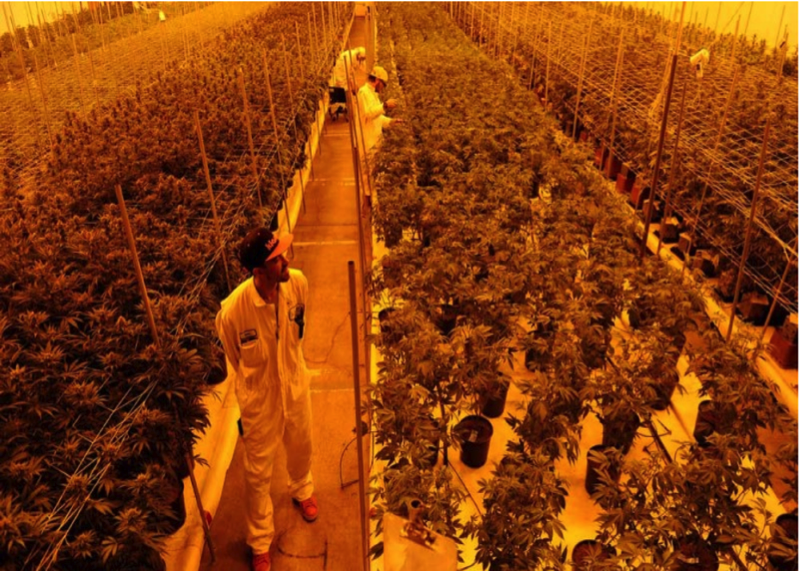 This means that to properly observe this safety measure, employees would be required to keep clear of the treated area for a full day, which I find unlikely to be enforced considering the daily requirements of a cultivation facility. Drift again poses a problem, but a much more serious one compared to the products on the CDA’s approved list. It should be obvious by now that, when considering facility or site design, compartmentalization is desirable and necessary. This goes for greenhouse and outdoor production, as well as indoor. In fact, some outdoor farmers in the Emerald Triangle area of northern California work multiple, separate parcels to hedge against the threat of crop loss wiping out their entire year’s efforts. Though the discussion above focused mostly on flowering plants; propagation, vegetative, and mother areas should be separate as well, as they effectively contain all future harvests and are therefore of paramount importance. The appropriate amount of compartmentalization will vary depending on the operation. In most agricultural businesses, some amount of loss is expected and incorporated into plans and budgets. In terms of areas for flowering plants, they should be compartmentalized to an extent that, should a severe infestation or systems failure occur, the loss of expected revenue from one or more rooms or areas will not cripple the business. Such loss should not happen often in a well-run, well-equipped facility. However, I have seen the drastic damage that russet mites can cause, in addition to experiencing the dread that permeates an entirely darkened warehouse after a transformer explosion, and would advise that cash flow projections take into account the possible loss of a harvest or two from a single room per year, just to be safe. In cannabis farming, as in all agriculture, we must plan for the worst and hope for the best. Compartmentalization is a fundamental and effective safeguard against small pest incursions becoming widespread infestations, while allowing for grow areas to be fully sterilized and decontaminated after a harvest without completely interrupting all operations. It also allows for the observance of REIs, PHIs (even self-imposed ones), and certain WPS guidelines much more easily than perpetual harvest models. Finally, while costing more up front, ongoing operational expenses can be lessened, with a greater return on the energy that is used. While the benefits of wide-open spaces are frequently touted in a variety of contexts, cannabis cultivation is one where being boxed in is preferable to ensure that your employees, plants, and investment are protected.